A country garden situated next to a fast flowing stream in rural Essex. Many aspects of this garden already existed, such as the log cabin and knarled old apple tree in the front garden, the island to the right hand side of the house and some well established trees, meaning that the design had to fit around these features. Furthermore, the clients kept chickens and ducks, so an ‘animal-proof’ garden was required. The front garden is self-contained behind wrought iron railings with a green oak pergola, seating, a log cabin and woodland planting. To the courtyard garden, which is a real suntrap, a raised pond was added, along with a greenhouse and paved with clay pavers. The back garden received the most drastic treatment, with old shrubs and some weak growing trees being removed to let in more light. A patio was added to catch the setting sun and a woodland planting scheme laid out. Decking was added outside the conservatory to take in the good views across the neighbouring fields. The banks of the stream were planted with tough marginal plants to add stability to the soil. The grass on the island is to be left to grow tall and paths cut through it leading to a swing and a bench. Self-contained front garden featuring a pergola, seating, log cabin and woodland planting. Raised pond added to the courtyard garden. 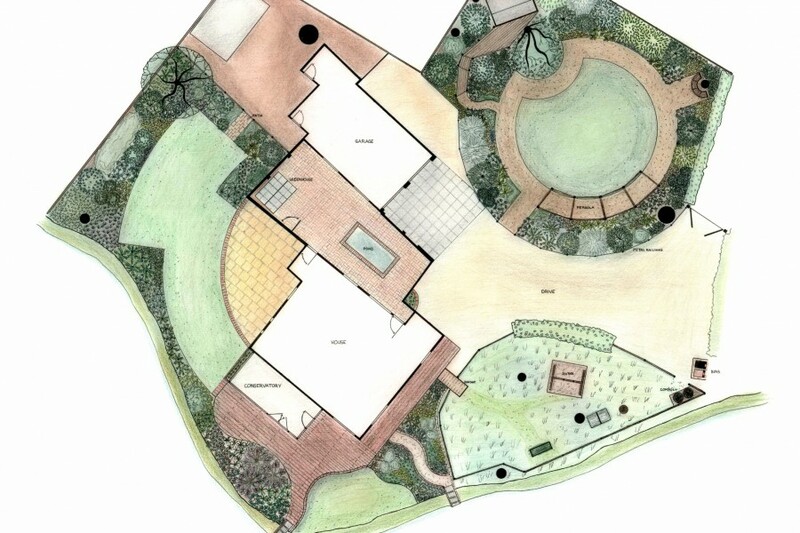 Sun-trap patio and woodland planting scheme added to the back garden. Decking to take advantage of the views. Banks of the stream stabilised with tough marginal plants.